If you’re reading this, you probably associate Flatout Motorsports with Mazda, and specifically with Miatas. And that’s great! We’re proud of our close relationship with Mazda Motorsports, and count us among those who believe the Miata is the roadracing miracle of the past 30 years. But we’re not a Mazda-only shop or rental firm, not by a longshot. And many casual fans and racers may not realize just how many possibilities Miatas present. So we thought we’d run down our present list of rental rides, along with their SCCA classes. What’s the right car for you? Depends on your experience level, the track, and your goals! Contact us to talk about it and reserve your seat. Get in on a good thing! We’ll be at Palmer Motorsports Park April 5-6 for first an open lapping day, then an SCDA event. Team Flatout will support at least 10 cars, so reserve your seat soon! The following weekend, it’s off to VIR for testing and an SCCA Hoosier Super Tour. We’re looking at 12 to 14 clients for that donnybrook! April 26-28, we’re at Summit Point for testing and an SCCA Double Major. If you can’t get in on our early April events, this is a great opportunity to rent. Contact us to nail down dates and go racing! Are you ready for racing season? With March comes a glimmer of hope … For now, we’re still supporting racers south of the Mason-Dixon line, but the shop is buzzing with prep work for northeasterners. Before you know it, we’ll be renting and arrive-and-driving at Thompson, the Glen, NHMS, and NJMP! Now’s the time to contact us and set your plans, whether that means general prep, upgrades, or securing a seat for a particular weekend. Spring is right around the corner – we promise! Winter roundup: Mills rips at Sebring, Penske shocks, new Mazda contingencies! Client Amy Mills had a dynamite January Hoosier Super Tour weekend at Sebring, taking third and fourth in an STL Miata that you can rent anytime! Speaking of which, we’ve got more Florida racing, a stop at COTA, and a trip to VIR coming up – check out our schedule and get out of the cold! We’ve already gained great setup experience with the Penske shocks that are now mandatory in Spec Miata. Contact us to get yours installed and tuned. Mazda continues to be the best marque in the world where motorsports support is concerned. 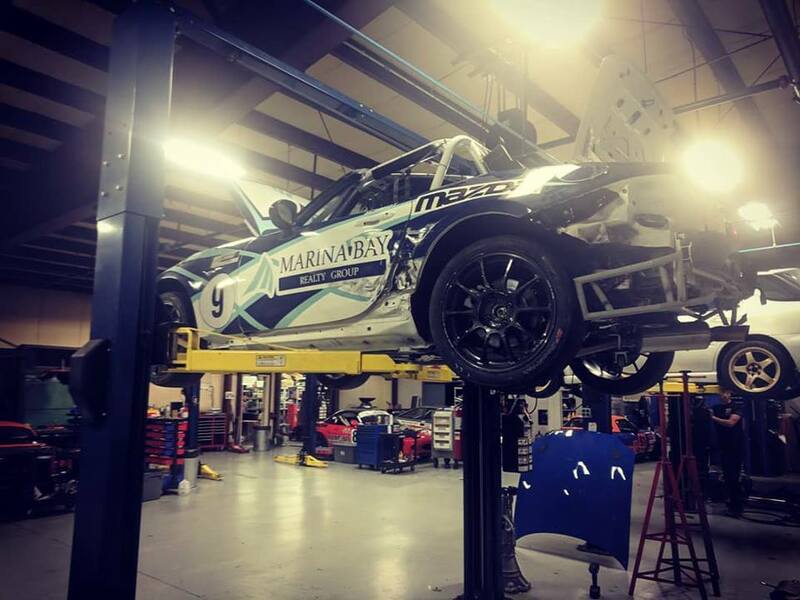 Did you know Mazda Motorsports is expanding its contingency program in some very innovative ways? Check them out here to learn more! 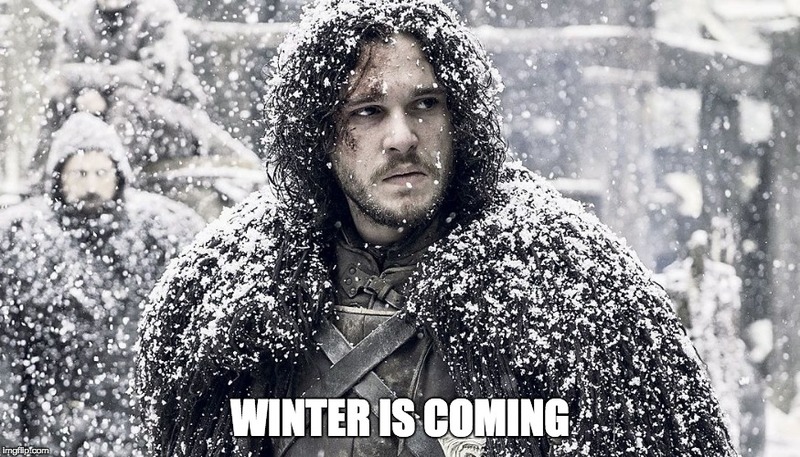 The Winter Series is here – come on down! Each Thanksgiving, we pack up the trailers and leave frosty New England behind. For many Flatout clients, winter racing at Sebring, COTA, VIR and other great tracks is the highlight of the year. Why not join them, either in your own ride (we’ll haul it down for you!) or one of our many rentals? Check out our schedule and contact us to get the ball rolling! Jam packed 2019 – book now! We’ve filled out our 2019 date book – and it might just set a Flatout record for days spent at tracks, supporting racers! While you’re compiling your Christmas list, check out the schedule and contact us to nail down your weekends. Flatout Motorsports Winter Series – sign up now! It’s here, friends, and it’s here until late March anyway. Rather than brag that by the time you read this, we’re on our way to Sebring for the Turkey Trot – great SCCA Regional racing wrapped around deep-fried Thanksgiving bird! – we hereby invite you to join us. But hey, we’re getting ahead of ourselves. 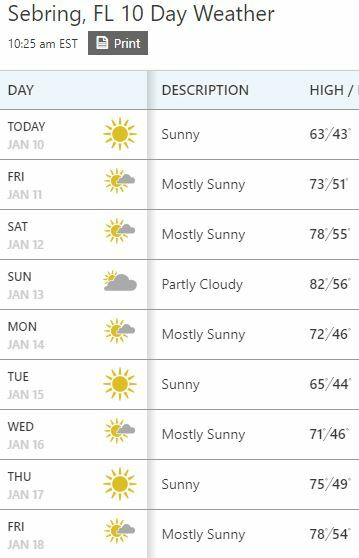 Check out our schedule and contact us to rent or have us bring your car down for some warm-weather Arrive & Drive competition! McHaffie’s second in STL caps a great Runoffs! A podium equals air time! Craig McHaffie interviewed after his second-place Runoffs finish. The 2018 SCCA Runoffs are in the books, and Team Flatout has much to be proud of. Craig McHaffie grabbed the headlines with his runner-up finish in STL, driving his Flatout-built Mazda MX-5. (And if anybody besides Flatout Motorsports had to win, there’s nobody we’d rather see in Victory Lane than our pal Danny Steyn!) Our own Joe Schubert took 13th spot, not far ahead of Whit Gregg (16th) and Amy Mills (17th). Iron Whit was Flatout’s sole entrant in the STU class, and he brought home an outstanding top 5 finish. Nice drive! Company prez Nick Leverone took fourth in T4. 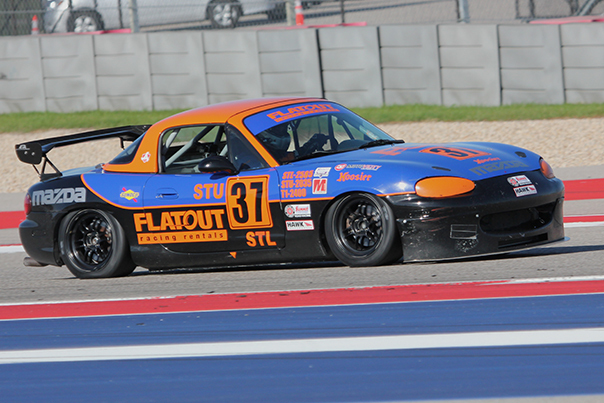 Nick also led the Flatout pack in Spec Miata, starting and finishing 13th. In that enormous field, Joe finished 32nd; Amy 33rd; and Whit 34th (a Flatout Motorsports mini-pack!). For complete results and, soon, video of the races, visit SCCA.com. It takes a hell of a lot of talent and determination to qualify for and run the nation’s premier amateur motorsports event – especially when said event is held 3,000 miles from home. A big hand, please, for all our entrants. And let’s not forget the crew, at both the track and the shop, who put great cars underneath the drivers all season long! Schmidt wraps up MX-5 Cup season with top 10! 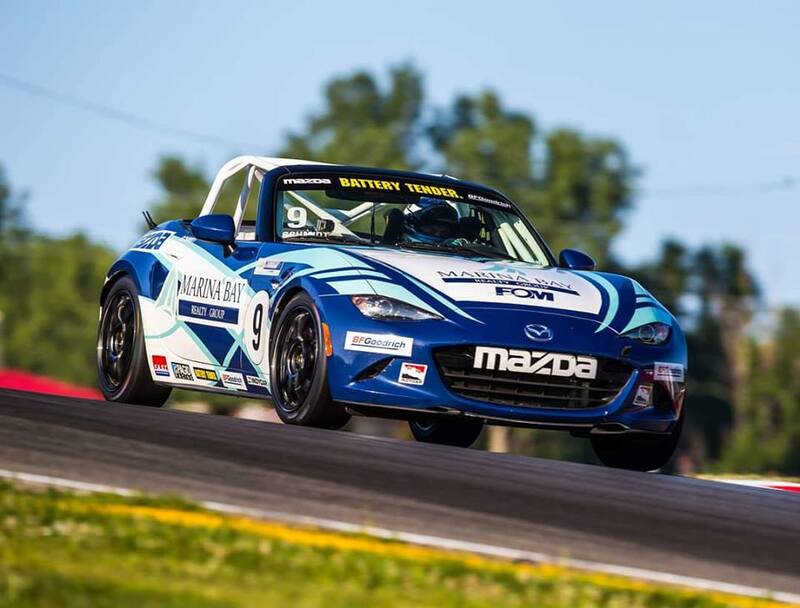 In his first season of Global MX-5 Cup racing, client Jesse Schmidt quickly established himself as a force to be reckoned with. Unfortunately, he hit a spinner at Portland International Raceway (nowhere to go) and his hotrod suffered heavy damage. It wasn’t pretty – see below. But the crew worked mightily to get the robust Mazda in shape for the season finale at Monticello … and Jesse made the effort pay off with an outstanding seventh-place finish. He was fast right off the trailer, and remained in the mix all weekend. Congratulations, Jesse! The 2018 season is now in the books, but Jesse, Charlie Belluardo, Matt Koskinen, and others are already mulling their 2019 plans for this touring series – one of the most competitive in the nation. Want to get in on the act next year? Contact us and let’s talk! Frenetic fall: MX-5 Cup, Runoffs, Devil in the Dark … and more! The Global MX-5 Cup finale, Sept. 28-29 at Monticello. The Big Dance: SCCA’s Runoffs, waaaaay over to the left of the map at Sonoma Raceway. We’ll field 7 more entries there, including Flatout President Nick Leverone and hotshoe clients Joe Schubert, Amy Mills, Whitfield Gregg, and Craig McHaffie – all running multiple classes (Iron Man Whit will race in 3 classes in the same car; that alone is worth the price of admission!). The Devil in the Dark 12-hour enduro at New Jersey Motorsports Park, where we’ve brought home the gold in the past. Finally, believe it or not, it’s not too early to plan your Winter Series racing with Flatout: We’ve got a good group heading for the annual Turkey Trot Thanksgiving Regional at Sebring. Contact us to get in on the action!